Whiplash Treatment – Chiropractic Works! If you’ve suffered a whiplash injury, it is important to see a chiropractor or other health care provider who specializes in whiplash treatment as soon as possible. The longer a whiplash injury goes untreated, the greater the risk of complications like headaches and chronic pain. Dr. McGahey has advanced training in evaluation, management, and whiplash treatment. So if you’ve suffered a whiplash injury, you can feel confident in knowing you will be well looked after. But don’t ignore your symptoms. The sooner you start whiplash treatment, the sooner you’ll recover and the less likely you are to have lingering effects. Over 40% of people with chronic neck pain can relate it to a whiplash injury from a car crash. That means their pain has been present for years! After a whiplash injury, your body starts making scar tissue which acts like glue in your joints and soft tissues. And while medication and rest can help with pain, they do nothing to help the long-term effects of your injury. In fact, they can make them worse! No one wants chronic pain, so the decisions you make in addressing your whiplash injury can make all the difference. Chiropractors are experts in dealing with this type of injury, but make sure you see one who has advanced whiplash training. And don’t wait! You only have a small window before scar tissue starts forming, and the longer you wait the more firmly this injury can take hold. In a car crash, a lot of energy is passed from the striking vehicle to the one being struck. Some of that energy is absorbed by the vehicles, but a lot can be transferred to the occupants. This can cause the neck to whip back and forth violently, causing a whiplash injury. Remember, the average vehicle these days weighs over 4000 pounds!!! But a whiplash injury can also result from falls, accidents, playing contact sports, and even riding a roller coaster. In fact, any sudden movement of the head and neck beyond its normal limits can cause a whiplash injury. The most common whiplash symptoms are pain and stiffness in the neck and upper back, and headaches. There may be pain and stiffness in the shoulders, middle and lower back, as well as numbness and tingling in your arms, legs, hands or feet. 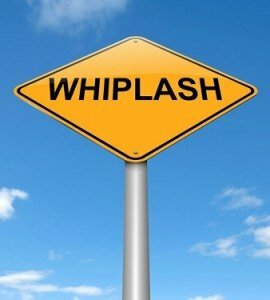 Less common symptoms of whiplash include dizziness, fatigue, foggy thinking, irritability, low energy and poor sleep. It’s important to note that after a whiplash injury your symptoms may not show up right away. This means that while some people may feel pain right after an injury, others may not feel symptoms for hours or even days after a whiplash injury. But this doesn’t mean that the injury is any less severe. The most important factor affecting a whiplash injury is awareness. That means whether or not you see an impact coming. When you know you’re going to be hit, you have a chance to tense up your muscles and really protect yourself. Contrary to popular belief, relaxing during a crash is the LAST thing you want to do. Successful recovery after a whiplash injury depends on proper evaluation and treatment. Dr. McGahey has advanced training through the Spine Research Institute of San Diego, one of the most trusted whiplash research institutes in the world. This means your care will be delivered by a whiplash specialist, using treatment methods that get great results with this type of injury. Once your whiplash injury is properly assessed, Chiropractic adjustments can help return normal motion to injured joints. Active Release can help break up scar tissue in injured joints, muscles, and other soft tissues. And specific exercises like McKenzie technique can keep things moving and healthy while you finish healing. Treatment can make the greatest impact in the first few days or weeks following a whiplash injury. So get checked out as soon as possible, before scar tissue can take hold. It not treated properly, whiplash can lead to chronic pain, headaches, and even early onset of arthritis. Even low speed collisions can cause significant injury, so don’t ignore your symptoms. Just call or click today to schedule an appointment or free consultation. Dr. McGahey has been helping people with whiplash injuries get out of pain since 1998, and chances are he can help you too! Schedule A Visit With Dr. McGahey & Start Feeling Better Today!